James Woody is a native of Roanoke, Virginia, and has resided in the Houston, Texas area for over 35 years. 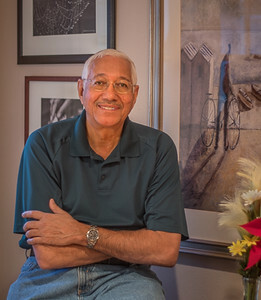 He began pursuing photography as a hobby, following retirement from a successful career as an IT / project management professional at ExxonMobil. Since then, photography has become a growing passion that encourages him to explore new places, to continuously look for beauty in his surroundings, to look for unusual / creative views of subjects, and to capture once in a lifetime moments that can be shared later. His key focus is fine art and architectural photography, using a wide variety of subjects. His fine art images showcase his vision of the world around him, and his ability to photograph fascinating views of landscapes, seascapes, nature, people scenes, still life, and more. James also provides professional architectural photography to architects, designers, and builders who need high quality images for use in marketing their services. He is a member of a number of photography groups in the Houston area, including the Houston Photographic Society, the Houston Photographic Study Group, and several photography meet-up groups. His solo exhibit, "The Art Of Seeing", was recently displayed at the Evelyn Meador Library in Seabrook, Tx., following his exhibit of the same pieces that were displayed at tommy’s Community Art Gallery in the Clear Lake area. He also participated in the following group exhibitions: Flatbed Press Gallery (in Austin, 2011), Houston Central Library (during FotoFest, 2014), League City Chamber of Commerce, (2014), and Freeman Library (in the Clear Lake, 2016). In addition, one of his images was featured on the cover page of the Clear Lake Area Newcomer and Relocation Magazine (Spring / Summer 2015 Edition). Regarding other background, James holds a Master's Degree in Business (MBA) from Atlanta University, a BS degree from Virginia State University, and continues to maintain his certification as a Project Mangement Professional (PMP). He is also a veteran of the US Army, where he served in his younger years as an infantry officer (airborne / ranger).